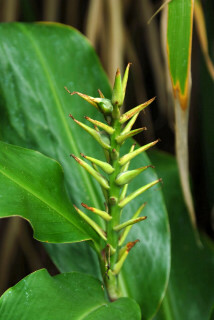 This page follows the progress of a few Kahili ginger seedlings on their journey to maturity. 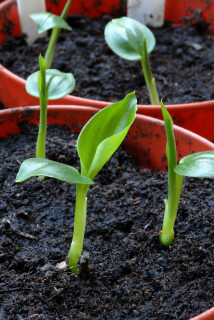 Out of a packet of 8, five seeds germinated on the 12th of February. The seeds on the 3rd of March and three of the seeds later on the 19th of April. 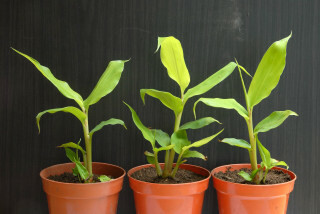 By the fourth of July (a holiday for some), the plants were ready for their first division. 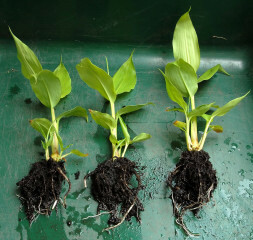 Three of the plants re-potted. 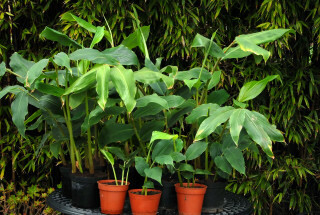 The plants remained in the greenhouse for their first season. 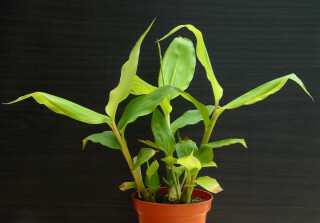 The picture to the right shows the growth achieved by the Kahili gingers by the 10th of October. 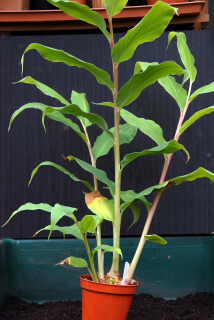 By the 13th of November the Hedychium gardnerianum plants were in need of one final potting on before winter. By mid May the plants and the weather were right for planting out in the garden. 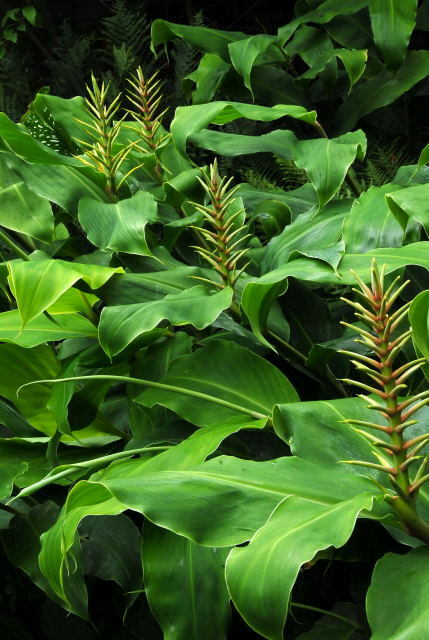 The kahili ginger plants were nestled in amongst a group of established plants. To the right Musa sikkimensis, to the rear Miscanthus floridulus and to the left Phormium 'Platt's black'. The leaves on a stalk on the right hand side of the picture is Firmiana simplex, a casualty of the next winter(s). 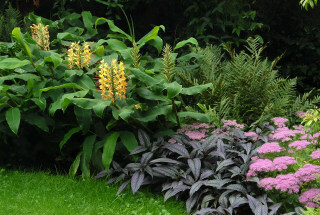 This had always been a troublesome spot as the established plants were not very good at sharing. All temporary plants that had been used in this spot in the past had struggled to look luxuriant regardless of how much water they received. 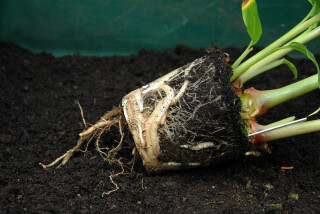 The idea was that the Hedychium gardnerianum plants would establish over time as they would not be removed from the soil. It was hoped that once established they would be able to fight their own corner. Fairly soon after planting, one particular plant decided to flower. 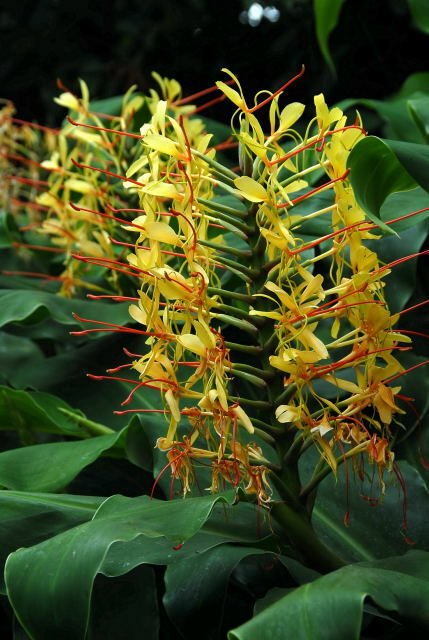 Unfortunately ornamental ginger flowers are a bit 'blink and you miss them' so no photo. As it was early in the season, the pod (top left horizontal bit) had time to swell and eventually split revealing three seeds. 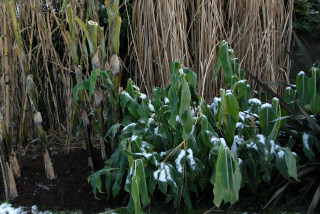 Winter came, a particularly vicious one, and the ornamental ginger plants were cut back and mulched as out lined here. By the 18th of May new shoots were visible. 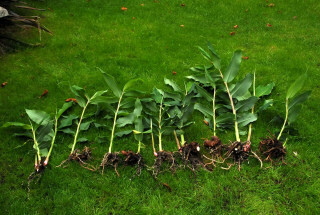 The previous winter had killed all Canna that had been left in the ground. The plants did grow but were not impressive. 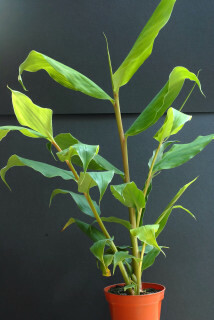 The Kahili ginger were left in the ground over winter once again to see if they needed just one more season to establish. Another cold winter passed, not quite as severe as the previous but -8°C (17.6°F) was the coldest night. Once again all in ground canna were fried. A number of plants that had just scraped through the 2009/2010 winter gave up after this one including Cyathea medullaris, Brahea armata and Firmiana simplex. By the end of the second 'established' season (third in the ground) it became clear that this location was not going to work. 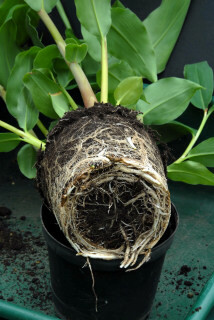 The plants were lifted, divided and potted up. 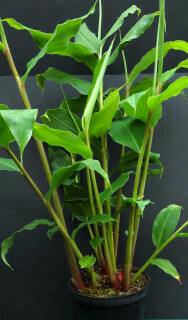 The Kalihi ginger spent the next winter in the greenhouse. 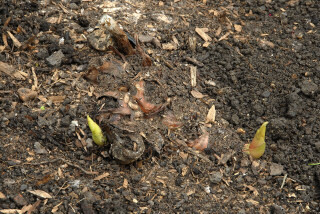 May again, the 8th this time and the ornamental gingers are eager to have an other go. 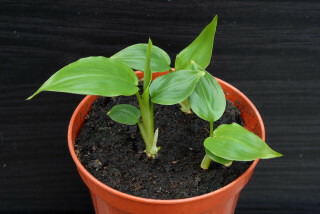 The area selected for them this time had less competition from other plants. 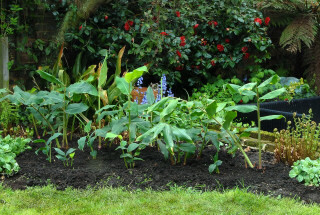 A number of hardy ferns and a clump of Aspidistra elatior were the main competitors. The area is largely in the shade of the house except for a couple of hours at the height of the summer. A Tamarisk provides dappled shade during these midday hours. The only direct sun the area receives is an hour or so in late afternoon. 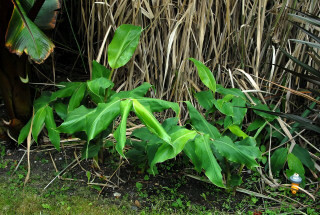 The main reluctance for planting the Hedychium gardnerianum previously is that the area is one of the last parts of the garden to warm up in the spring. 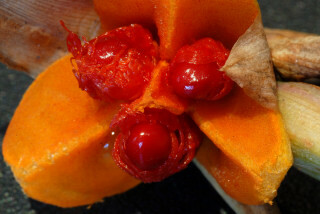 The concern being that a slow start into growth may not leave enough time for the flowers to develop. For this year at least the plants seemed to enjoy the location. The summer started out with drought conditions and hosepipe bans followed by lots of rain and very poor light. In comparison, most other plants in the garden under performed relative to previous years. So finally after 5 seasons a decent show of flowers. If the Kahili ginger plants had been planted in this spot back in '09 it most probably would have only required 2 seasons from seed to flower (but we'll never really know..).